Wire transfer is the fastest mode of receiving money in your U.S. Bank account. You can receive money from within USA (Domestic Wire Transfers) or from a foreign country (International wire transfer). The transaction is initiated by the sender through a financial institution, however, you need to provide your banking details to the sender for successful transfer of money. International wire transfer is one of the fastest ways to receive money from foreign countries. Banks use SWIFT network for exchanging messages required for performing international wire transfer. Usually, the receiving bank (in USA) and the sending bank (in other country) need to have a direct arrangement in place to start the swift transfer – this is sometimes referred to as correspondent banking. You can receive funds to your U.S. Bank account from any bank within USA using domestic wire transfer. You need to provide the following details to sender of the funds who will initiate the domestic wire transfer through his/her financial institution. 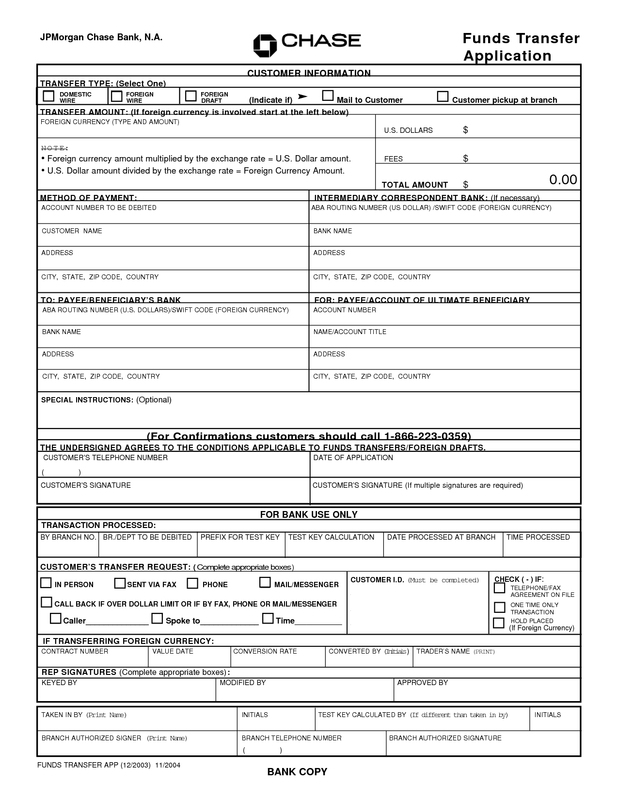 The completed and signed Wire Transfer form can be provided to any of U.S. Bank NA Branch. Wire transfer requests must be received and confirmed by cut-off time of U.S. Bank NA. Note: For international wires requested after U.S. Bank daily cut-off time, due to fluctuations in the foreign exchange rates, international wire transfers for amounts other than U.S. currency will be estimated and processed on the next business day at the foreign exchange rate valid at that time. You can know wire transfers cut-off time for U.S. Bank at any of your local banking center. Wire transfer is the fastest mode of receiving money in your Chase Bank account. You can receive money from within USA (Domestic Wire Transfers) or from a foreign country (International wire transfer). The transaction is initiated by the sender through a financial institution, however, you need to provide your banking details to the sender for successful transfer of money. You can receive funds to your Chase Bank account from any bank within USA using domestic wire transfer. You need to provide the following details to sender of the funds who will initiate the domestic wire transfer through his/her financial institution. To transfer funds to an International/Domestic account from your Chase Bank account, you need to fill Wire Transfer Request Form. The completed and signed Wire Transfer form can be provided to any of JPMorgan Chase Bank NA Branch. Wire transfer requests must be received and confirmed by cut-off time of JPMorgan Chase Bank NA. Note: For international wires requested after Chase Bank daily cut-off time, due to fluctuations in the foreign exchange rates, international wire transfers for amounts other than U.S. currency will be estimated and processed on the next business day at the foreign exchange rate valid at that time. Wire Transfer daily Cut-off Time is 4 p.m. except for Private Banking clients scheduling wires from a Florida or California account. Wire Transfer daily Cut-off Time for Private Banking clients scheduling wires from a Florida account is 12:00 p.m. and California account is 3:00 p.m.
Wire transfer is the fastest mode of receiving money in your Wells Fargo Bank account. You can receive money from within USA (Domestic Wire Transfers) or from a foreign country (International wire transfer). The transaction is initiated by the sender through a financial institution, however and need to provide your banking details to the sender for successful transfer of money. Bank Name : Wells Fargo Bank, N.A. You can receive funds to your Wells Fargo Bank account from any bank within USA using domestic wire transfer. You need to provide the following details to sender of the funds who will initiate the domestic wire transfer through his/her financial institution. To Transfer funds to an International/Domestic account from your Wells Fargo Bank account, you need to fill Wire Transfer Request Form. The completed and signed Wire Transfer form can be provided to any of Wells Fargo Bank Branch. Wire transfer requests must be received and confirmed by cutoff time of Wells Fargo Bank. Note: For international wires requested after Wells Fargo Bank daily cutoff time, due to fluctuations in the foreign exchange rates, international wire transfers for amounts other than U.S. currency will be estimated and processed on the next business day at the foreign exchange rate valid at that time. Wire Transfer daily Cutoff Time for Outgoing international wire transfers from a consumer account is 3 p.m. CT (Central Time). Wire Transfer daily Cutoff Time for Outgoing domestic and international wire transfers and outgoing drawdowns is 4:30 p.m. CT (Central Time). Wire Transfer daily Cutoff Time for Incoming wires is 5:30 p.m. CT (Central Time). Requests received after Cutoff Time will be processed the next business day.